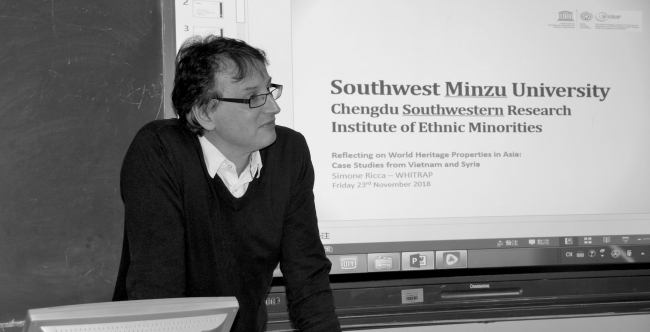 Simone Ricca, Vice-Director of WHITRAP Shanghai, was invited to Chengdu to present two lectures at the Southwestern Research Institute of Ethnic Minorities of Southwest Minzu University (SMU), in the framework of the “2018 SMU Foreign Expert Project Lecture Series”. The two 2-hour long lectures presented WHITRAP and the 1972 World Heritage Convention to students, researchers and SWU university staff. They were attended by some 60 people from the university and were followed by a lively debate. The 22nd November lecture, World Heritage List: a Tool for Development aimed to introduce the World Heritage Convention, underlining its constant evolution and growing connections with the larger framework of the UNESCO Cultural Conventions and of the United Nations Sustainable Development Goals (SDGs). The lecture also presented the structure of UNESCO World Heritage Centre and the activities of the World Heritage Institute of Training and Research for the Asia-Pacific Region (WHITRAP), underlining the growing role China plays in the World Heritage international arena. The 23rd November lecture, Reflecting on World Heritage Properties, case studies from Syria and Vietnam, discussed the political and social implications of heritage and world heritage listing, building upon Simone Ricca’s professional expertise. Examples from Vietnam and Syria permitted to highlight some of the underlying issues related to heritage preservation and to draw the attention of the public to the often un-perceived implications of cultural heritage preservation in the World Heritage context. Next： WHITRAP Suzhou attended The "Intelnational Workshop for Senior Professionals 2018 - Management of Historic Cities and Community Cooperation"